Below are common attributes associated to Mugo Pine (Dwarf). Become a care taker for Mugo Pine (Dwarf)! Below are member comments regarding how to plant Mugo Pine (Dwarf). No comments have been posted regarding how to plant Mugo Pine (Dwarf). Be the first! Do you know how to plant Mugo Pine (Dwarf)? Below are member comments regarding how to prune Mugo Pine (Dwarf). No comments have been posted regarding how to prune Mugo Pine (Dwarf). Be the first! Do you know how to prune Mugo Pine (Dwarf)? Below are member comments regarding how to fertilize Mugo Pine (Dwarf). No comments have been posted regarding how to fertilize Mugo Pine (Dwarf). Be the first! Do you know how to fertlize and water Mugo Pine (Dwarf)? Below are member comments regarding how to deal with Mugo Pine (Dwarf)'s pests and problems. No comments have been posted regarding how to deal with Mugo Pine (Dwarf)'s pests and problems. Be the first! Do you know how to deal with pests and problems with Mugo Pine (Dwarf)? Looking for Mugo Pine (Dwarf)? 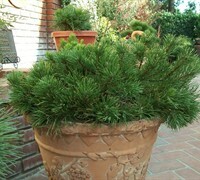 The mugo pine is tolerant and grows well in clay, loam, sand, acidic or alkaline soils. The one requirement is a well-draining soil. It likes a moist, but not wet soil. Constantly soggy soil is a killer. Much of the mugo pines roots grow close to the surface. A two inch layer of mulch spread over the planting site will help to keep the roots cool in the warmer months. Unlike the "Pumilio" variety there is very little pruning needed to keep a low, rounded appearance. Prune your mugo in the spring after the new growth (called candles) has almost reached their full length. Cut back the new growth by half to three-fourths depending on how low and dense you want your plant. The plant will produce growth buds at the point where the new growth was cut producing denser growth of branches next year. Try not to prune your plant to late in the spring as this may produce only one new bud that may not help thicken up your plant next year. Study your plant each year and decide how you want it to look and prune it accordingly. You may want it to have a more free form character and taller in height. In this case you may want to prune the new growth to a lesser degree or not at all. Try never to prune your plant back into older growth as new buds will not grow at these cut points. Mugo Pines do not need much fertilizer. In fact, if you fertilize your pine tree too much, or water it too often, you can harm its natural growth rate and form. The tree will not be the size and shape that it should be. Fertilize new pine trees once a year, until the tree is two or three years old. I always fertilize my pines in the early spring before new growth starts. The best type of fertilizer for pine trees is a slow releasing fertilizer formulated for pine trees or a fertilizer for shrubs and trees. The surface roots of the Mugo pine can be burned easily if fertilizer is applied to heavily. I usually apply the fertilizer at a lesser rate than noted by the manufacturer. When using a liquid fertilizer I cut the application rate in half. After the pine tree has been planted for two or three years, look at the new growth. If the tree is growing the rate it should be, do not fertilize it. After the first two or three years, the only fertilizer that your pine tree may need is iron. You can give iron to trees any time of year, spring, summer, or fall. Iron will help the tree to maintain its proper color. People sometimes plant mugo pine trees with the false assumption that they're all dwarfs and end up with plants too big for the space in which they're growing. This drawback is somewhat offset by mugo pines' slow growth rate. If you find yourself stuck with a mugo pine tree that is growing beyond the dwarf size you had been expecting, you can step in and shape the plant to some degree, through partial removal of the new candles in spring; this will slow the growth rate further. There are many varieties of the Mugo Pine. The three most easily found in nurseries or garden centers are "Pumilio", "Mughus", and "Mops". The Pumilio variety tends to have a more open form with smaller needles than the other varieties. It may also need more annual pruning of the candles if you desire to keep its height low. The Mughus grows natually more dense, limbs less open, and will take less pruning to keep it at a lower height. After growing all three I consider the Mops variety a dwarf more than the other two as it grows more dense and needs very little pruning to stay low in a rounded mound form.